Today I’m racing at Moonee Valley. The rail is in the true position and the track is rated in the good range. The rail is in the same position as the last meeting seven days ago when we received a lot of rain and I’m looking forward to walking the track to see how it has recovered and how it may race throughout the day. Race 1 is the Punters.com.au Plate over 1200 metres for two year olds, my ride here is MAKTABBA who is trained by the Hayes, Hayes and Dabernig team. I rode this daughter of Per Incanto (USA) at her debut run at the same track over 1000 metres on December 7th. She started favourite on that occasion and was ridden quietly from an outside barrier. She stayed on very well and I feel the extra distance will suit her. Her effort was further enhanced with the pattern of racing at that meeting showing no horses won from being ridden off the speed. She has the addition of ear-muffs pre-race to help her stay relaxed and it will be interesting to see the natural improvement she has taken. She has unfortunately drawn a wide barrier again and although I haven’t received my instructions yet, it is likely that she will be giving them a head start. She has very good ability and I like the feel she gave me on debut. 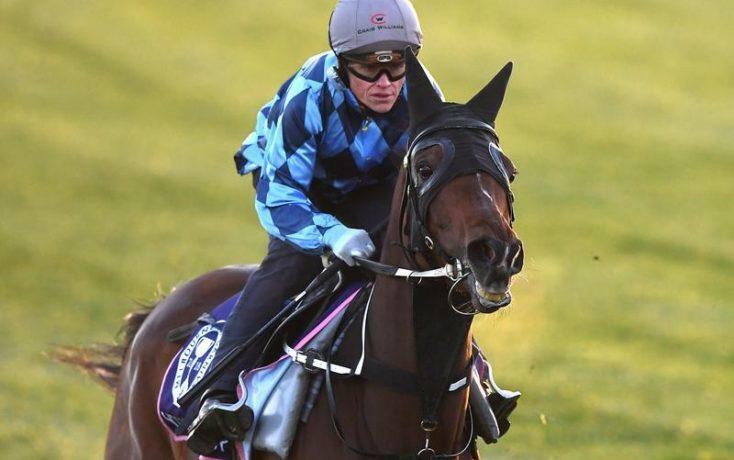 Providing she has taken natural improvement and the track is racing evenly, I expect her to be finishing off strongly. Race 2 is The Junction Club Handicap over 1600 metres, my ride here is LYNCH MOB who is trained by Tony McEvoy. He’s a five year old gelding by Wanted that is lightly raced and has a record of 17 starts for two wins and eight placings. His first up effort was pleasing at Caulfield where he resumed over the same distance and was closing off well for third place. He is a horse that generally doesn’t show any speed from the barriers and takes some time to muster speed. This race looks like it maps well for him with a good amount of speed and I expect him to be one of the main chances. Race 3 is the BM70 $99 Summer Membership Handicap over 1200 metres for three year old fillies, my ride here is SORA who is trained by Hayes, Hayes and Dabernig team. This daughter of I Am Invincible is lightly raced having had two lifetime starts. She made her debut in a city race that I won on My Pendant, who has since won her next two starts, so the stable must have a high opinion of her. Sora won her next start at the same track and distance as today where she produced a dominant effort when racing on speed. There looks to be a lot of pressure on paper and this race will be run at a fast pace. With confidence and experience from her last start win she is the horse to beat. Race 4 is the BM70 Ladbrokes Handicap over 1000 metres for fillies and mares, my ride here is CARIBBEAN PEARL who is trained by Mark Young. She’s a four year old daughter of Barbados that wears the colours of Rosemont Stud. She has been very competitive throughout her career and has run bold races in stronger company than this. I like the fact she is dropping back in distance as she looks to get a bit keen in her races. It will be my first ride on her and I’m looking forward to riding her over the short course from an inside barrier draw. There looks to be a good amount of pressure and speed on paper and she should get an economical run and can make her presence felt. Race 5 is the BM70 Dean & McPherson Catering Handicap over 1600 metres for fillies and mares, my ride here is ROSSO ANTICO who is trained by Stephen Lenehan. She’s a six year old mare by Gallo Di Ferro (USA) that finished second two starts ago at Sandown in BM64 grade to Zou York who is the favourite in an earlier race today, so we will have an indication if the form is going to measure up before she runs. She then dropped back to 58 grade at Colac and produced a dominant effort to win by over two lengths last start. She steps back up in grade here, carries two kilos off the minimum and has confidence from her last start win. If she can utilise her inside barrier as she races close to the speed, I feel she can make her presence felt as this is not an overly strong BM70 race. Race 6 is the Events @ The Valley Handicapover 2040 metres, my ride here is AL GALAYEL (IRE) who is trained by Ciaron Maher & David Eustace. He’s an imported five year old gelding by Zoffany (IRE) that hasn’t run a bad race since arriving to Australia. I had my first ride on him last time out at the same course and distance and his winning effort was full of merit. He goes up in grade here but drops two kilos in weight and will carry half a kilo above the minimum. This is a small and competitive field but based on his last start effort, he is the horse to beat. Race 7 is the BM78 New Year’s Eve at Legends Handicap 2500 metres, my ride here is STORMY SHORE who is trained by Ken Fythe. She is a seven year old mare by Bramshaw that comes into this race with a gear change of the ear-muffs being removed at her first attempt over the extended distance. She is a mare that can get keen in running and it is important that I can get her to relax and conserve her energy. She has been finishing her races off nicely and her trainer is confident that she is now looking for this distance at this stage of her career. Race 9 is a handicap over 1000 metres, my ride here is THERMAL CURRENT who is trained by Darren Weir. This eight year old gelding by Exceed And Excel is raced by Contract Racing and partners. He has been racing in excellent form this preparation and won a Listed race at Flemington over the carnival. He is horse that gets back and settles off speed, needing luck in running and there looks to be a good amount of speed in this race which will suit him. If the track is playing favourably for horses to run on and things go his way, he can win this and I’m really looking forward to riding him as he is racing in very good form. Today I’m racing at Caulfield where it’s the Boxing Day meeting. The rail is out six metres and the track is rated in the good range. Race 2 is the BM70 Joe Brown Handicap over 1100 metres, my ride here is Redcore who is trained by Greg Eurell. This four year old gelding by Choisir is raced by Lionel Krongold and partners. He races here third up and on his best form, will be winning this. He has drawn the outside barrier and will need some luck in running. There looks to be a good amount of pressure and speed on paper and the quicker the field travels the more likely they are to spread out and I can find a nice position. He is a horse that appreciates a strong tempo where he can finish off strongly over the concluding stages. Race 3 is the BM84 Dennis Hanrahan Handicap over 1400 metres for fillies and mares, my ride here is Flying Krupt who is trained by Phillip Stokes. This four year old mare by Krupt is in excellent form this preparation having won her past two races. This will be her fourth run this campaign and her first run in Melbourne for the preparation. Although this is her first attempt at the 1400, she was strong through the line last time out over 1300 and it looks like the extra distance will be of no disadvantage to her. It is a small but competitive field and if she continues her consistent form she can make it three wins in a row. Race 4 is the Frank O'Brien Handicap over 1400 metres, my ride here is Lord Tennyson who is trained by Peter Chow. He’s a six year old gelding by Written Tycoon that has been racing well without winning, I rode him to his last win which was in June 2017 and have won two races on him. This is his favourite distance and he has only raced at this track once previously so it’s hard to draw a comparison on track statistics for him. He has come up with a nice inside barrier and on his best form will be one of the main chances. Race 5 is the Ken Sturt Handicap over 1400 metres, my ride here is Amadeus who is trained by Michael Kent. He’s a six year old entire by Amadeus Wolf (GB) that is raced by Joan Walker and partners. I’ve ridden this horse consistently throughout his career and have really enjoyed being a part of his development, especially winning the VOBIS Gold Bullion at his last start at Pakenham on Cup Day. He comes into this with confidence from his last start victory, the inside barrier, staying at the same distance and drops 4 kilos in weight. He looks well placed here and is the horse to beat. Race 6 is the Listed MRC Lord Stakes over 1700 metres, my ride here is Shoreham who is trained by Saab Hasan. He’s a nine year old gelding by Reset that has been a grand campaigner throughout his career, winning five races from 66 starts and amassing over three quarters of a million dollars. He hasn’t won for some time with his last win being the Group 3 Easter Cup where he won at big odds. He will be the outsider in this field and it’s an interesting race as he will be racing against six horses and there is no speed on paper, so it will be a tactical affair. My horse has blinkers added to his head gear again and hopefully it helps him to return to his best form. Race 7 is the Listed Ladbrokes Christmas Stakes over 1200 metres, my ride here is Native Soldier who is trained by Darren Weir. He’s a three year old colt by Sepoy that is taking on the older horses here. He comes into this second up for this preparation and I had my first ride on him last start at Flemington where he raced over the straight course and was beaten by just over 1.5 lengths. He has a good record at Caulfield and is a dual Group winner around the circuit. I expect he will have taken a good amount of natural improvement from his first up effort and will take a lot of beating in this. Race 8 is the BM78 Ladbrokes Handicap over 1600 metres, my ride here is Critical Thinking who is trained by Brent Stanley. This five year old gelding by So You Think (NZ) is raced by Cloud 9 Racing and partners. He has been racing in excellent form this preparation and he comes into this with confidence from his last start win over 1440 metres. He is racing on a seven day turn around that saw him produce a solid effort at the track last week, he steps up in grade but drops in weight. He has drawn a wide barrier and we will need luck throughout the early stages. He is racing in great form and if he maintains that will be very competitive. Today I’m racing at Flemington. The rail is in the true position and the track is rated in the soft range. Race 1 is the BM70 Santa's Workshop Plate over 1400 metres for three year old fillies, my ride here is MY PENDANT (NZ) who is trained by Danny O'Brien. This daughter of Pins is raced by Waikato Stud and partners. I’ve ridden her at her past two starts where she has won both over 1200 metres and she now steps up in distance to the 1400 for the first time. 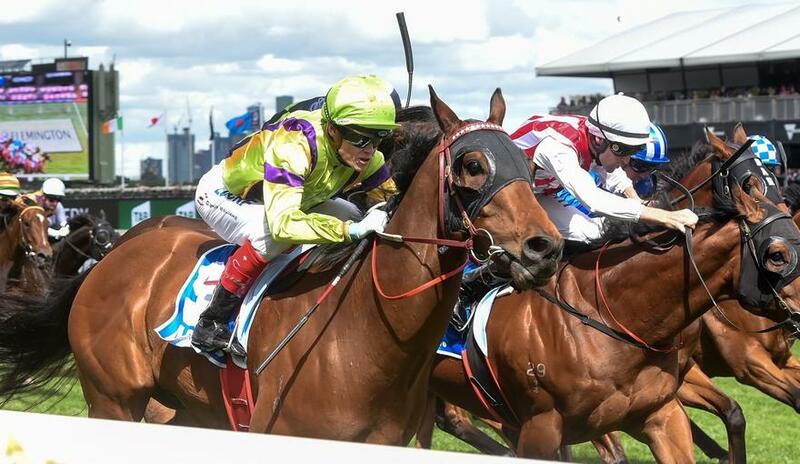 I have been very impressed with her performances, at her most recent start at Moonee Valley she settled at the rear of the field and produced a dominant effort to circle the field and win by an official margin of 1.25 lengths. I feel the step up in distance will suit her and this race is a nice stepping stone for her going forward, as she has shown above average ability. I’m looking forward to riding her on the spacious and flat Flemington track and she is the horse to beat. Race 2 is the BM70 Christmas Raceday Trophy over 1200 metres, my ride here is POISED TO STRIKE who is trained by the Hayes, Hayes and Dabernig team. This three year old gelding by Akeed Mofeed (GB) is raced by Goldin Farms. He had three starts last preparation in Adelaide resulting in a win, a second and fourth placing. I have ridden him in two recent jumpouts in preparation for his first up assignment and have been very impressed with the way that he is going. This will be his first time racing over the straight course, but if he produces the same form from his jumpouts, he will be winning this. Race 3 is the BM84 Nominate Now for the All-Star Mile over 1600 metres, my ride here is DIAMOND BOW who is trained by Wendy Kelly. I won on her at the end of her last preparation over 1400 metres at Geelong when racing on a heavy track. First up this preparation we had no luck and things didn’t go to plan at Cranbourne. She was slow away from the barriers on that day, as she can be, and had to work the whole way out wide to make ground, she did too much work and finished last. She looks to have found her good form again and her most recent effort at Sandown, with an apprentice riding her, was a good effort. She steps up in distance here, carries the minimum weight and will start from the inside barrier. She is a mare that gets back in running but she won’t have to give up any ground from the barrier. This is not an overly strong BM84 and I expect she can make her presence felt if she runs up to her best form. Race 4 is the Happy Holidays Handicap over 2500 metres, my ride here is ONCIDIUM RULER who is trained by Michael Kent. I’ve ridden this seven year old gelding by Strategic to victory last year when winning at Moonee Valley over the same distance. He races third up here and should be close to peak fitness with runs over 1600 and 2040 metres this campaign. He has drawn a wide barrier and carrying 2.5 kilos above the minimum, I expect he will be closing the race off strongly over the concluding stages. Race 5 is the BM64 VRC Christmas Donation Appeal Trophy over 1400 metres, my ride here is FALLEN EMPIRE who is trained by Mathew Ellerton & Simon Zahra. This four year old gelding by Smart Missile is raced by First Light Racing. He is racing on a seven day turn around after racing here last Saturday and is stepping up in distance to the 1400 for the first time. I’ve been impressed with him after watching his replays and I’m looking forward to having my first ride on him. He is a consistent horse that has never finished worse than fifth in his five starts to date, with four of those seeing him finish in the top three. He looks to be a very progressive horse and I expect he can win this on his way to better races. Race 6 is the BM84 Festive Season Sprint over 1000 metres, my ride here is DEMOLITION who is trained by James Cummings. He’s a five year old gelding by Street Cry (IRE) that is raced by Godolphin. He races here second up and is dropping back in distance. This will be his first attempt racing over the straight course at Flemington. He is a horse that has a racing pattern of settling at the rear of the field but I expect him to show his class here today and be finishing off strongly with a good turn of foot. This is a strong field but on his best form he will be one of the main chances. Race 7 is the BM84 Yuletide Handicap over 1400 metres, my ride here is PORTMAN (NZ) who is trained by Danny O'Brien. He’s a six year old gelding by Makfi (GB) that I know well and have ridden regularly throughout his career when he was owned by Qatar Bloodstock. I rode him in a recent jumpout at Werribee and was pleased with the feel he gave me. The soft track conditions will be to his liking and if he finds his best form he can figure in the finish. Race 8 is the BM78 Summer On The Lawn Handicap over 2000 metres, my ride here is CREEDENCE who is trained by the Hayes, Hayes and Dabernig team. He’s a four year old gelding by Helmet that is lightly raced and from his 11 starts has a record of two wins and four placings. He has really matured this preparation and is racing very consistently, at his last three starts he has won and been narrowly beaten twice. He has drawn a wide barrier and has a versatile racing pattern and can be ridden on or off speed. He is in great form and looks well placed here where he will carry 1.5 kilos above the minimum. I feel with luck in running he can add a third win to his name. Race 9 is the BM78 Merry Christmas VRC Members Handicap over 1200 metres, my ride here is BEACON who is trained by James Cummings. This four year old gelding by Lonhro is raced by Godolphin. He is a lightly raced consistent galloper that always runs well and from his 11 starts has a record of two wins and five placings. His most recent run was at the end of the Spring Carnival where he finished just over 4.5 lengths behind Order Of Command, who is one of the favourites in an earlier race today. Beacon comes into this six weeks between runs and I rode him in a recent jumpout at Werribee in preparation for this assignment, where he went extremely well. He has drawn an outside barrier so it will be interesting to see how the track is racing throughout the day. On his recent form and the way he jumped out at Werribee, he will be one of the main chances. Tonight I’m racing at the Moonee Valley night meeting. The rail is in the true position and the track is rated in the good range. There are showers forecast throughout the evening and I’m looking to walking the track to see how it will race. Race 1 is the Daemco Plate over 1200 metres, my ride here is VICTORY KINGDOM who is trained by the Hayes, Hayes and Dabernig team. She’s a three year old filly by Animal Kingdom that is having her first race start and wears the colours of Team Valor. Although I haven’t ridden her in a jumpout, I have ridden against her at a set of recent jumpouts as she prepared for this. She looked to show nice ability and did everything correctly. If she brings her professional attitude and can produce the same ability she displayed in her heat, she will take a lot of beating. Race 2 is the Salt&Pepper Homewares Plate over 1600 metres, my ride here is NECESSITAS (NZ) who is trained by Mathew Ellerton & Simon Zahra. She’s a three year old filly by Zacinto (GB) who is having her fifth lifetime start. She has solid form and has been consistent throughout her career. Her strong grounding as a two year old should hold her in good stead for this campaign and her future racing. She started favourite in her first up run at Cranbourne this preparation where she was beaten by less than a length. She steps up in distance here and from a middle barrier will be able to settle where she is comfortable in running. I feel she will be one of the main chances in this race. Race 3 is the BM64 Ladbrokes Handicap over 1500 metres for three year old fillies, my ride here is ROCK DOVE who is trained by James Cummings. This daughter of Epaulette is raced by Godolphin. She comes into this race with confidence from her last start victory at Cranbourne where she had blinkers applied to her head gear for the first time and produced a dominant effort. She comes through the same race as NECESSITAS who I am riding in race 2, so it will be interesting to see how she performs and if she can frank the form. Rock Dove has drawn an inside barrier and with confidence from her last start win, and the fitness benefit of racing third up for her preparation, will be one of the main chances. Race 4 is the Bertocchi Magical Kingdom Handicap over 1500 metres, my ride here is TAVISOCKS (NZ) who is trained by Luke Oliver. This four year old mare by Tavistock (NZ) is raced by Grand Syndicates. This will be my first ride on her, she looks well placed in this distance range as having watched her replays, she looked to be over-racing at her most recent runs over 1900 metres. She has drawn a good barrier and should gain an economical run in transit. In this small but competitive race, based on her best form she can make her presence felt. Race 6 is the BM64 Xtreme Freight Handicap over 2500 metres, my ride here is MAN ALIVE (NZ) who is trained by Archie Alexander. This four year old gelding is by Reliable Man (GB) and is raced by Robert McClure and partners. He is lightly raced having had four starts and has only missed a top three placing once. Although this will be my first ride on him, I have been impressed by his replays. He is a progressive horse that based on his breeding will appreciate the step up in distance to the 2500. He has a good racing style as he races close to the speed and should be suited around the circuit. He has drawn favourably and will gain an economical run at his first time over the extended distance and he should take a lot of beating. Race 8 is the Crown Resorts Handicap over 1200 metres, my ride here is CINCINNATI RED (NZ) who is trained by Leon & Troy Corstens. She’s a four year old mare by Reset who always runs a good race and has a record of 10 starts for one win and five placings. She has been in great form at her two runs this preparation when winning first up at Geelong and then finishing second at Sandown. She has drawn a wide barrier and if we have luck from the draw and she maintains her good form, I expect her to be the horse to beat. Today I’m racing at Caulfield where it’s a twilight meeting. The rail is out 12 metres and the track is rated in the good range. This is the first meeting on the track since the Caulfield Cup Carnival and I’m looking forward to walking the track and seeing how it races throughout the day. 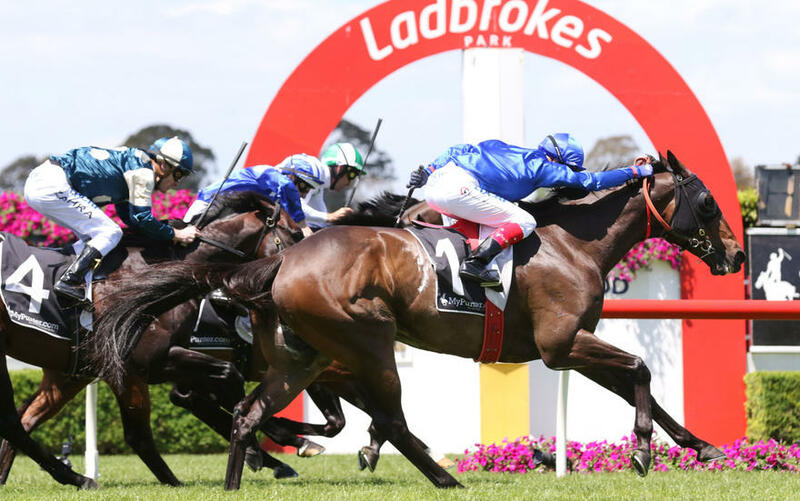 Race 2 is the Ladbrokes Plate over 1440 metres, it’s a maiden for three year old’s and upwards. My ride here is CRYPTIC JEWEL (NZ) who is trained by Brent Stanley. This four-year-old mare by Savabeel races second up for the preparation here and is having her fifth career start. I rode her in her first up run at Moonee Valley over 1200 metres and she now steps up in distance which will really suit her. She has drawn an inside barrier and in this small but competitive field, I feel if she has taken natural improvement coming into this, she will be hard to beat. Race 8 is a BM64 handicap over 1600 metres my ride here is SHAQ (NZ) who is trained by Brent Stanley. This five year old gelding by Savabeel has raced consistently throughout his career and has a record of four wins and nine placings from his 30 starts. He has had five runs this campaign and drops back in distance to the mile from 2040 metres. This is his favourite distance range as from his four starts at the distance he hasn’t missed a top three placing. He has drawn a middle barrier and is a horse that can settle in the first half of the field. On his recent solid form and with a small amount of luck in running, he can win this. Today I’m racing at Flemington. The rail is out 10 metres and the track is rated in the soft range. Race 1 is the SecondBite Plate over 1100 metres for two year olds, my ride here is MOVIE ROLE who is trained by the Hayes, Hayes and Dabernig team. She’s very well bred being by Fastnet Rock and out of the mare Aspen Falls (USA), making her a full sister to Irish Lights who won the Group 1 Thousand Guineas. Her most recent jumpout was at Werribee on Monday where she wore blinkers and made all the running and was solid through the line in her heat. She comes into her debut run without blinkers and will wear winkers instead. She has drawn a high barrier in a small field which is usually not a disadvantage when racing over the straight course. This will be my first time riding her and I’m looking forward to seeing how she presents pre-race and performs under raceday pressure for the first time. Race 2 is the BM70 Sports Environment Alliance Handicap over 1400 metres for three year olds, my ride here is REALLY SWISH who is trained by Leon & Troy Corstens. He is a colt by Real Saga who has had 10 career starts and has won or placed in half of those. He comes into this with confidence from his last start win at Sandown over 1600 metres and drops back in distance here. He has drawn a middle barrier and with the confidence from winning his maiden last start and his overall good form, he is capable of winning this competitive race. Race 3 is the BM84 VRC Employee Volunteer Program Trophy over 1720 metres, my ride here is ETYMOLOGY who is trained by James Cummings. This six year old gelding by New Approach (IRE) is raced by Godolphin. He has a great affinity with this track as from his four starts here he has finished second on three occasions. He ran extremely well here three starts ago where he finished second when racing in BM90 grade over 2000 metres. He then returned to Sydney for his next two runs with his most recent run which was last Saturday, looking a plain effort on face value. On his best form and on his Flemington form, in this small field he can be one of the main chances. He also has the advantage of racing well on rain affected track conditions, so should any further rain arrive throughout the day it won’t be a disadvantage to him. Race 6 is the BM70 VRC Schools Program Trophy over 1720 metres, my ride here is LORICAIN who is trained by Symon Wilde. This race is restricted to three and four year olds only. Loricain is a four year old mare by Americain (USA) that is lightly raced and from her four lifetime starts has won twice and placed once. 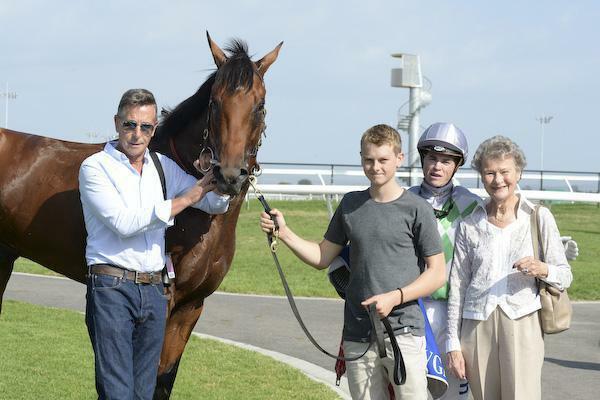 She comes into this race with confidence after a dominant effort last start at Warrnambool where she won by seven lengths when racing on soft ground. I rode her younger sister over the carnival and I’m looking forward to riding this mare today. She has drawn a low barrier in this competitive race and with the benefit of confidence from her last start win and the soft track conditions in her favour, she will be one of the main chances. Race 7 is the Saddle Up School Holiday Program Sprint over 1100 metres, my ride here is NATIVE SOLDIER who is trained by Darren Weir. He is a three year old colt by Sepoy that is taking on the older horses here. He has excellent form and is a dual Group 3 winner from last preparation where he won the McNeil Stakes and Guineas Prelude. He is a horse that races on speed and has previously raced over the straight course, he pulled up with a vet issue after that run and still produced a good effort to be beaten by only 2.15 lengths. He has drawn a high barrier and although he has raced once on a soft track, his best form has been on a firmer surface. He races first up here and is on a path towards the Magic Millions three year old race in January. I’m looking forward to having my first ride on him as he is a talented colt that will be prominent in the three year old races throughout the Summer and Autumn months. Race 8 is the BM78 Make-A-Wish Australia Trophy over 2540 metres, my ride here is EARTH ANGEL who is trained by the Hayes, Hayes and Dabernig team. She’s a four year old daughter of Animal Kingdom (USA) out of the mare Miss Finland. Miss Finland was a horse I had great success on as she was champion two and three year old and she also won the Golden Slipper and VRC Crown Oaks. This will be my first ride on Earth Angel and she will be at peak fitness having had three runs this preparation. She is a mare that has been placed in Group 3 company at her only attempt at the distance. She can over race and do things wrong so I will be mindful of that in running, if I can get her to relax and she runs out the distance strongly, with the benefit of carrying half a kilo above the minimum, she will be one of the main chances. Race 9 is the BM84 Wingate Avenue Community Centre Trophy over 1100 metres, my ride here is CHATUCHAK who is trained by James Cummings. She’s a five year old mare by Lonhro that is raced by Godolphin. She races here second up and has a consistent record of four starts for a win and two placings when second up. With previous exposure to the straight course and the track conditions to her liking, on her best form she can make her presence felt in this very competitive field. Tonight I’m racing at the Moonee Valley night meeting. The rail is out 6 metres and the track is rated in the slow range with showers predicted throughout the evening. The last two meetings the rail has been in the true position so we will be racing on fresh ground but when the rail is in this position it usually favours horses racing close to the speed. It will be interesting to see how the track walks and if any pattern has developed prior to my first ride for the evening. Race 5 is the BM70 Ladbrokes 55 Second Challenge Heat 8 over 955 metres, my ride here is SISTER KITTY MAC who is trained by Symon Wilde. She’s a five year old mare by Kaphero that I won on last preparation at the course and distance. She comes into this fifth up for this campaign with the blinkers removed from her head gear. She has drawn an outside barrier and is a mare with good natural speed from the gates. There looks to be a lot of pressure and speed in this race and if she races to her best form she will be in this for a long way. Race 6 is the BM64 Australian Unity Handicap over 2040 metres, my ride here is VELLASPRIDE who is trained by Danny O'Brien. He’s a lightly raced four year old gelding by Clangalang who, from his six career starts has recorded one win and one third placing. He races here third up this preparation and stayed on nicely at his most recent run over 1600 metres at Bendigo when the blinkers were applied for the first time. He steps up to this distance range for the first time and if we get some luck from a wide barrier draw I expect him to be staying on well. Race 8 is the BM70 Drinkwise Handicap over 1600 metres for fillies and mares, my ride here is VITANI who is trained by Wendy Kelly. She’s a lightly raced four year old mare by Animal Kingdom that is building a strong record and from her eight career starts has only missed a top three placing once. She finished fourth on that occasion to Fifty Stars (IRE) who went on to win two races through the Spring Carnival. Vitani won two starts ago at Cranbourne and at her most recent run was pleasing in the same grade at Sandown over 1400 metres. She steps up in distance to the mile for the first time and will appreciate the rain affected surface and her chances will be further enhanced if the predicted rain arrives. I trialled her before she had her first race start on a heavy surface at Cranbourne and she handled it very well. She is a very adaptable mare that is racing consistently and has drawn a good barrier to gain an economical run in transit and should be hard to beat. Today I’m racing at Wyong where I have one ride for the Hayes, Hayes and Dabernig training partnership. The rail is in the true position and the track is rated in the good range. Race 6 is the Magic Millions Wyong 2yo Classic over 1100 metres, my ride here is CHAMPAGNE BOOM. She’s a lightly raced filly by Spirit of Boom that I have ridden in both of her race starts. She won on debut in dominant fashion at Caulfield over 1000 metres and had her second start at Flemington on Melbourne Cup day where she finished third. Although she closed the race off nicely, I felt she didn’t show her great turn of foot at Flemington due to the torrential rain we had prior to and during the race. She now returns to a firmer surface and this will be her first attempt racing the Sydney way of going. She is contesting this race in the lead up to the 2 year old Magic Millions race that will be held on the Gold Coast in January. I’m really looking forward to seeing the improvement she has taken from her last run when she presents in the mounting yard and how she copes going right handed under raceday pressure for the first time. She has shown very good natural ability and I expect her to be very hard to beat. Today I’m racing at Spendthrift Australia Park where it’s Werribee Cup Day. The rail is in the true position and the track is rated in the good range. Race 5 is the Welsh Homes F&M BM64 Handicap over 1400 metres, my ride here is MISS ADEQUATE who is trained by Danny O'Brien. This five year old mare by O’Reilly (NZ) races first up for her preparation, she has won or placed in half of her first up attempts. She is well placed in this race as she is racing on her rating and has been allocated the top weight of 60 kilos. This is only a small field and she has drawn favourably in barrier one with her usual pattern to settle on-speed. She has trialled nicely at Cranbourne in preparation for this and will give herself every opportunity to win from a good barrier draw. Race 6 is the TAB Werribee Cup over 2000 metres, my ride here is SECOND BULLET who is trained by Danny O'Brien. I rode him in this race last year where we drew an outside barrier in a big field and carried 58 kilos. He drops to 54.5kgs this year which is half a kilo off the minimum and has drawn a wide barrier in a small field of nine gallopers. He races second up here and this is his favourite distance with a record of six wins, five seconds and six third placings. He is versatile in his racing style and it will be interesting to see how the track is racing throughout the day and if there is any pattern or bias. With no weight on his back and his versatility with his racing style, this looks a really good race for him to win. Today I’m racing at Racing.com Park where it’s Pakenham Cup Day. The rail is in the true position and the track is rated in the good range. Race 1 is the John Duff & Co 3YO BM70 Handicap over 1000 metres, my ride here is SYMPHONETTE who is trained by Phillip Stokes. This filly by Helmet has had four lifetime starts and has only missed a top two placing once. Her two runs this preparation have been in Adelaide where she was impressive when winning both of those. She comes into this third up and three weeks between runs. She will start from an outside barrier and with some luck in running in this competitive field she will be one of the main chances. Race 3 is the Fulmen Park F&M BM78 Handicap over 1400 metres, my ride here is IT’S A MYTH who is trained by Phillip Stokes. She’s a four year old mare by Sepoy that is raced by Mill Park Stud and Mills Breeding. I rode her at her most recent run at Sandown where she was very slow to begin and closed the race off nicely to finish in fourth place. She is stepping up in distance and it will be important that I can get her to jump with the field so she doesn’t give them too much of a head start. If she can jump and travel where she is comfortable and shows her good acceleration she will be closing off strongly. She will appreciate the drop in weight to the minimum here and carries 4.5 kilos less than her last start. Race 4 is the Grand Vue Springlands BM78 Handicap over 2000 metres, my ride here is ROYAL ORDER who is trained by Mick Kent. This five year old gelding by Commands has been racing in good form this preparation and comes into this fourth up. He hasn’t been out of the top three placings this campaign and has been a very consistent galloper throughout his career. He stays at the same distance as his last start where he finished second at Moonee Valley and looks to be a strong middle-distance horse. He looks well placed here and with luck in running from an outside barrier I expect he will produce another strong effort. Race 5 is the Nasahi AAC Plate over 1000 metres, my ride here is PREZADO who is trained by Mathew Ellerton & Simon Zahra. He’s a four year old gelding by Denman that has had 12 starts for a record of one win and five placings. He is racing on a seven day turn around and on his best form would be one of the main chances. He has displayed good ability throughout his career against high quality sprinters and if everything falls into place for him today, which I think it will, he can continue his consistent form. Race 6 is the Schweppes David Bourke Memorial Handicap over 1600 metres, my ride here is FASTNET LATINA (IRE) who is trained by Archie Alexander. This six year old imported gelding by Fastnet Rock is raced by OTI Racing and partners. He is a lightly raced horse that is very talented. 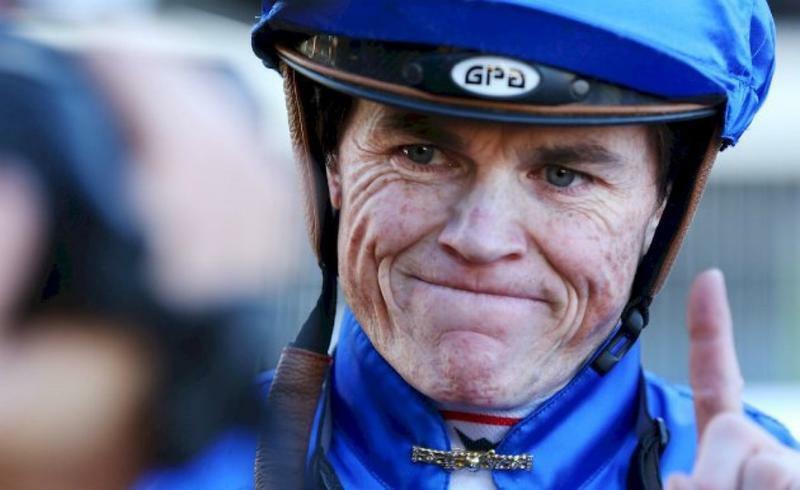 From his 13 career starts he has a record of four wins and four placings. He is versatile in his racing pattern and has raced well when ridden on speed and from a mid- field position. He has drawn a wide barrier so it will be interesting to see what my instructions are pre-race. He has the benefit of the minimum weigh of 54 kilos and this will give him every opportunity against this competitive field. Race 7 is the Listed Sportsbet Pakenham Cup over 2500 metres, my ride here is TALLY who is trained by James Cummings. This six year old gelding by Street Cry is raced by Godolphin. I rode him to success in his three year old season and hadn’t ridden him for some time until his most recent start at Sandown where we were successful in the Group 3 Eclipse Stakes. He steps up in distance here with three weeks between runs and should gain an economical run in transit from a low barrier. He has been racing consistently this preparation in Group level throughout the Spring against our best horses and will take a lot of beating in this. Race 8 is the Racing.com VOBIS Gold Bullion over 1400 metres, my ride here is AMADEUS who is trained by Mick Kent. This race is restricted to VOBIS Gold horses only. Amadeus is a six year old entire by Amadeus Wolf (GB) that is raced by Joan Walker and partners. He won this race last year and he comes into this fourth up for the preparation. His runs have been spaced and this is a formula that he seems to appreciate. I rode him in a jumpout on Monday in preparation for today’s assignment. He is going very well and with luck from an outside barrier is one of the main chances. Race 9 is the Sportsbet Racing Form Handicap over 1200 metres, my ride here is SYLPHEED who is trained by Matt Cumani. She’s a five year old mare by Real Saga who is having her first start since changing trainers. She races here fourth up with some eight weeks between runs. She hasn’t won for almost a year to the day, with her last victory on December 9th2017 at Doomben in Listed grade. She has been racing well without winning in Group races for mares throughout the Spring. She has drawn a good barrier to gain an economical run and will carry the minimum weight. She has a versatile racing pattern and can be ridden effectively on or off speed. On her best form she will take a lot of beating in this. Tonight I’m racing at the Moonee Valley meeting. The rail is in the true position and the track is rated in the good range. Race 1 is the Opus Group Plate for two year old fillies over 1000 metres, my ride here is MAKTABBA who is trained by the Hayes, Hayes and Dabernig team. She’s by Per Incanto (USA) and races in the Shadwell Stud colours. Although I’ve never ridden her I have watched her jumpout at Flemington. She looks to have good natural ability and is very professional. She has drawn the outside barrier and is competing against a small field of fillies that are all having their first start. I’m looking forward to seeing her pre-race and how she handles the exposure to raceday conditions for the first time. From what I have seen of her, she will take a lot of beating in this if she has some luck from the outside barrier. Race 3 is the MSC Signs Plate over 1200 metres, my ride here is CRYPTIC JEWEL (NZ) who is trained by Brent Stanley. This four year old mare by Savabeel races first up for her preparation here. Last campaign she had three starts for a third placing. She is a horse that has never raced over this distance and usually settles in the second half off the field and finishes off strongly. I expect she will have matured and developed from her first preparation and will be closing off strongly over the concluding stages of this race. Race 4 is the Daemco Handicap over 1600 metres, my ride here is ADINA ROSE who is trained by Declan Maher. She is a four year old mare by Ad Valorem (USA) that is raced by Colin and Janice Mckenna. She is lightly raced and from her nine starts to date has won or placed at five of those. She has been in great form without winning this preparation and her last two starts at Mornington have seen her beaten by the narrowest of margins. She is stepping up slightly in distance and has winning form over the 1600. She has drawn an inside barrier and is a horse that settles on, or close to the speed and makes her own luck. If she continues her recent good form, she will take a lot of beating in this. Race 6 is the BM70 Premiair Handicap over 1400 metres, my ride here is ROX THE CASTLE (NZ) who is trained by Kerry Edwards. He is a progressive four year old gelding by Castledale (IRE) who, from his four career starts has only been out of the top two once and since arriving to Australia, hasn’t missed the top two placings. His best form is on soft ground but he looks to have very good ability to adapt to all surfaces. He races second up here and is stepping up to the 1200 which is the distance he won over twice last campaign. He has drawn a low barrier in a race where there looks to be a good amount of pressure. He is a horse that settles close to the speed, so it will be interesting to see what my instructions are pre-race. I’m looking forward to having my first ride on him as he looks to be a galloper with plenty of upside to progress on to better races throughout the Summer and Autumn months. Race 8 is the BM70 Coast to Coast Handicap over 2040 metres, my ride here is QUEEN LEONORA (NZ) who is trained by Danny O'Brien. This four year old mare by Savabeel is raced by Waikato Stud and partners. I had my first ride on her last start at the course where she ran really well when competing out of her grade in a BM84, and was beaten by just over a length. I feel this step up in distance will suit her combined with the drop back in grade to BM70. If she brings her form from her last run, she will be winning this. Today I’m racing at Sandown on the Hillside circuit. The rail is out 6 metres and the track is rated in the good range. Due to scratching’s today, my riding engagements have been reduced to just the one ride for the meeting. Race 6 is the BM78 Araza Handicap over 2400 metres, my ride here is KALALO who is trained by Matthew Brown. This five year old gelding by Zoffany (IRE) has been a model of consistency. He put together three wins in a row before a solid effort at Sandown over the same distance last time out that saw him finish in third place in a BM64 where he carried 60.5 kilos. He goes up in grade here and drops in weight to 55.5 kilos. He is a horse that makes his own luck by racing on speed and although this is a harder race, he will appreciate the weight relief and will take a lot of beating in this. Today I’m racing at Moonee Valley. The rail is in the true position and the track is rated in the good range. Race 1 is the Santa's Workshop @ The Valley Handicap over 1200 metres, my ride here is BEHEMOTH who is trained by David Jolly. This three year old gelding by All Too Hard is raced by Grand Syndicates and partners. He is lightly raced and from his three starts to date has only been out of the top two placings once. 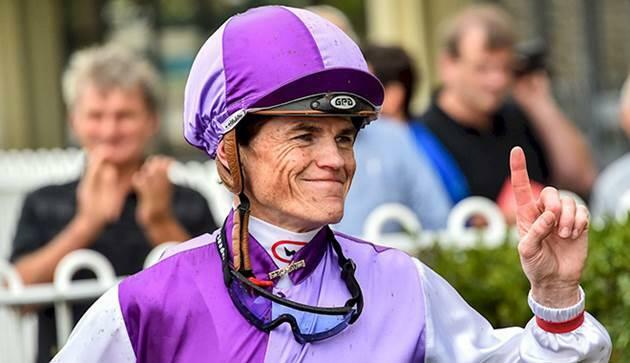 He commenced this preparation with an impressive win in Adelaide on November 6th and has the benefit of a recent official trial to keep his fitness levels up to the mark. He is a horse that looks to have above average ability and is still learning his craft, as he tends to get his head up at times and can race ungenerously. He will start from an outside barrier in this small field and if he can produce a professional performance, I expect he will be winning this. Race 2 is the BuildSafe Plate over 1000 metres, my ride here is NAMIMO who is trained by the Hayes, Hayes and Dabernig team. She is a two year old filly by Choisir who is having her debut run. There is limited exposed form here with only three runners having been tested under raceday pressure. Although I haven’t ridden her, she has been professional and well educated in what I have seen from her jumpouts. If she can utilise the inside barrier draw to her advantage, I expect she will be strong to the line. I’m looking forward to seeing how she presents pre-race and how she performs under raceday conditions. Race 3 is the BM70 Keller Handicap over 1200 metres for three year old fillies, my ride here is MY PENDANT (NZ) who is trained by Danny O'Brien. This daughter of Pins is raced by Waikato Stud and partners. She is a progressive filly who is lightly raced and is building a good record, from her three career starts she hasn’t missed the top two placings. I rode her in her most recent start at Sandown where she won her maiden over the same distance and she was very strong to the line. She is stepping up in grade but with confidence from her last start win I feel she will be the horse to beat, provided she has taken natural improvement from her effort at Sandown. Race 4 is the Inglis Catalogues Out Now Handicap over 1500 metres, my ride here is THE REGIMENT who is trained by John Moloney. He’s a four year old gelding by Hinchinbrook who has been consistent throughout his career with a record of 17 starts for one win and eight placings. Although he hasn’t won for some time, he hasn’t been beaten by far. He will start from an outside barrier and if we have luck in running and he maintains his recent good form, he is one of the main chances. Race 5 is the BM84 Handicap over 1600 metres for fillies and mares, my ride here is QUEEN LEONORA (NZ) who is trained by Danny O'Brien. She’s a four year old by Savabeel who is raced by Waikato Stud and partners. She’d been racing in great form throughout her career until her most recent effort where she finished last and was disappointing. If her last start can be forgiven and she regains her previous consistent form, she can be competitive. Race 6 is the Spendthrift Australia Handicap over 1000 metres for fillies and mares, my ride here is ESSENCE OF TERROR who is trained by Mathew Ellerton & Simon Zahra. This daughter of Reward For Effort is six years old and comes into this third up for the preparation. She has got excellent statistics at the course and distance and her two runs this campaign have seen her finish first and second over the short course of 955 metres. There looks to be a good amount of speed on paper here and she has a versatile racing pattern having been effective when racing on-speed or settling in a mid-field position. If she has luck from the barrier draw, she is the horse to beat. Race 7 is the Independent Turf Services Handicap over 1000 metres, my ride here is THERMAL CURRENT who is trained by Darren Weir. This eight year old gelding by Exceed And Excel runs in the colours of Contract Racing. He ended a long run of outs two starts ago when he won at Listed grade at Flemington during the Carnival. His next run was full of merit and although he finished in sixth place, he was only 1.4 lengths from the winner. He is a horse that settles in the second half of the field and if the track is racing evenly and allowing horses to finish off, it will further enhance his chances. He will carry the top weight of 60 kilos and will jump from barrier 9. He meets the favourite worse off at the weights but my horse seems to be really enjoying his racing, is in great form and thrives at the course and distance. Race 8 is the Adapt Australia Handicap over 2040 metres, my ride here is AL GALAYEL (IRE) who is trained by Ciaron Maher & David Eustace. He’s a five year old gelding by Zoffany (IRE) who, since being imported to Australia has been in great form and hasn’t run a bad race. Although he is yet to win at this distance, it looks like this race is going to set up nicely for him from an inside barrier draw. He has been a model of consistency and looks well placed here where he will carry 2.5 kilos above the minimum and is the horse to beat. Race 9 is the BM78 Woodside Park Stud Handicap over 1200 metres, my ride here is DEMOLITION who is trained by James Cummings. This five year old gelding by Street Cry is raced by Godolphin. My only ride on him was last preparation at the same course and distance, and it was definitely one to forget. We had no luck and only gained clear galloping room with 200 metres to go, running on strongly to finish second. He races first up here and comes into this with an excellent record when racing fresh. He has drawn a wide barrier and if the track is racing evenly and allows him to run on from back in the field, he will be finishing over the top of them. Today I’m racing at Ascot where it’s one of Western Australia’s feature race meetings of the year, with the Group 1 Railway Stakes the main event. The rail is in the inside position and the track is rated in the good range. Race 3 is the Listed Carbine Club Of W.A. Stakesover 1400 metres, my ride here is IN LOVE WITH PARIS who is trained by Fred Kersley. This four year old gelding by Rogano is raced by Oakland Park Stud. He’s been a very consistent horse throughout his career, from his 11 race starts he has recorded four wins and five placings. He comes into this third up for the preparation and stepping up in distance for the first time this campaign. He will start from a middle barrier in this small but competitive field and should get a lovely run in transit from the draw. It would be great for him to get another win and continue to build on his impressive record. Race 4 is the Listed TAB Touch-Placid Ark Stakes over 1200 metres for three year olds, my ride here is PABLO’S POEM who is trained by Sean Casey. This gelding by Lope de Vega is owned by Wally Daly. He is a progressive horse who from his six lifetime starts has only missed a top two placing once. He finished fifth on that occasion and ran well to be only 1.5 lengths from the winner. With luck in running from a wide barrier he is one of the main chances in this competitive field. Race 6 is the Listed Crown Perth-Jungle Mist Classic over 1200 metres for fillies and mares, my ride here is SHOWCASE who is trained by Adam Durrant. This four year old mare by Big Brown is raced by Peters Investments. She comes into this third up after winning when racing fresh this preparation. Her second up run saw her finish 8thof 10 runners on a day when it was hard for horses to make ground from an outside barrier draw. She has drawn a tricky barrier again here but if she has luck from the draw and finds her best form, she is one of the main chances. Race 8 is the Group 1 Kirin-Railway Stakes over 1600 metres run under handicap conditions, my ride here is ICONOCLASM who is trained by Darren Weir. This four year old entire by Toorak Toff is raced by Rosemont Stud and Fern Vale Farm. From his last three starts he has won two and at his most recent run was beaten by less than three lengths in the Group 1 Cantala Stakes over the same distance, which will be a great form reference for this race. He is a tough horse that usually races on speed and will carry the minimum weight of 53 kilos here. He has drawn a wide barrier and there looks to be a good amount of pressure on paper and we will need luck from the draw. I’m looking forward to riding him and hopefully securing him a Group 1 win that will secure his future at stud. Today I’m racing at Sandown. The rail is in the true position on the lakeside circuit and the track is rated in the soft range. Race 2 is the MyPunter.com Plate over 1200 metres, it’s a maiden race for three year old fillies, my ride here is MY PENDANT (NZ) who is trained by Danny O'Brien. This daughter of Pins races in the colours of Waikato Stud. She’s had two lifetime starts, finishing second in both runs over the same distance. She will start from a middle barrier in what looks to be a very competitive field and she is one of the main chances. Race 3 is the Spicer Thoroughbreds Handicap over 1200 metres, it’s a BM64 for three year old’s, my ride here is REWARD THE MAID who is trained by Matthew Williams. She’s a filly by Reward For Effort who, from her three starts has only missed a top three placing once. She steps up in class and distance here and from an inside barrier draw will be given every opportunity in this small field of quality runners. Race 4 is the BM64 Ladbrokes Handicap over 1600 metres, my ride here is BLACK AND TAN who is trained by John Moloney. This four year old mare by Sebring is raced by Joe O’Neill and partners, racing in the Prime Thoroughbred colours. She has very good three year old form, with form around Peaceful State who is competing in the Group 1 Railway Stakes in Perth on Saturday. She comes into this fourth up this preparation and off the back of an unplaced effort at Flemington where she ran extremely well in a strong fillies and mares race, when racing in restricted room over the concluding stages. She will need good speed throughout the early stages as her racing pattern is to get back and run on. If the track is racing evenly and the race is run to suit her, she has the best form in this and is the horse to beat. Race 5 is the BM70 Le Pine Funerals Handicap over 1400 metres, my ride here is MR EXCLUSIVE who is trained by Matthew Brown. He’s a three year old gelding by Magnus who takes on the older horses here. He has competed in Group company against his own age at his past three starts and his runs have been pleasing. He has drawn an outside barrier, is dropping back slightly in distance and has a weight advantage against his older rivals. Race 6 is the BM64 Clanbrooke Racing Handicap over 2400 metres, my ride here is KALALO who is trained by Matthew Brown. He’s a flashy looking five year old chestnut gelding by Zoffany (IRE) who stands out in the parade ring. He has been racing in great form of late, winning at his past three runs. He makes his own luck in running and although he has drawn a wide barrier, his usual pattern is to race on-speed. He looks well placed here with his good form and this looks a suitable race for him to maintain his winning streak and he will take a lot of beating. Race 7 is the BM78 Araza Handicap over 2100 metres, my ride here is CABIERRO who is trained by Anthony Freedman. She’s a lightly raced four year old mare by Pierro, who from her 10 career starts has a record of two wins and four placings. She races fifth up here this preparation and will be at peak fitness for the step up in distance. She has been racing consistently well throughout this preparation and is a mare that races close to the speed, making her own luck. She will be given every opportunity to gain an economical run in transit from a favourable barrier draw and has the added benefit of carrying the minimum weight. Race 8 is the BM64 The Jacqualene Hare Memorial over 1200 metres, my ride here is IT’S A MYTH who is trained by Phillip Stokes. She’s a four year old mare by Sepoy who has been a model of consistency throughout her career, only missing a top three placing twice from her 11 starts. This will be her first start in Victoria but she comes into this with strong South Australian form as a two and three year old. She has drawn a wide barrier and with her usual racing pattern of settling in the second half of the field, she will need the track to be racing evenly and the race run to suit her to allow her to finish off. It is a large field and there looks to be a good amount of pressure on paper which will enhance her chances and I expect her to be finishing strongly over the concluding stages. Today I’m racing at Sandown where it’s Sandown Classic Day. The rail is in the true position on the hillside circuit and the track is rated a good 4. Race 1 is the Listed Thoroughbred Club Merson Cooper Stakes for two year old’s over 1000 metres, my ride here is MEMPHIS ROCK who is trained by the Hayes, Hayes and Dabernig team. This colt by Fastnet Rock races in the navy blue colours of Coolmore. He’s had two career starts in black type races and has been less than 4.5 lengths from the winner in both. It’s interesting to note that this will be his first time racing around a turn as both of his runs have been over the Flemington straight course. He is the most experienced horse in the field and the previous exposure to raceday conditions and pressure will hold him in good stead for this. 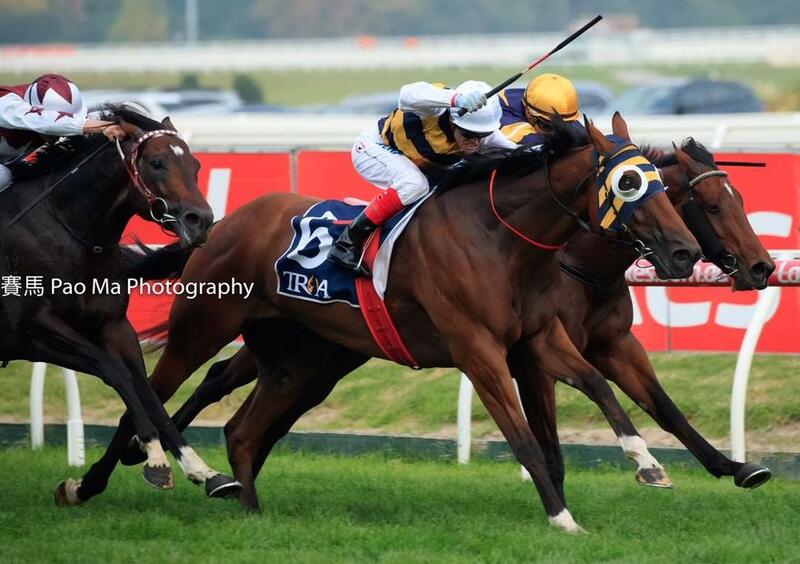 Race 2 is the Listed Ladbrokes Sandown Cup over 3200 metres, my ride here is YOGI (NZ) who is trained by Darren Weir. This six year old gelding by Raise the Flag (GB) is raced by Australian Thoroughbred Bloodstock and partners. From his four runs at the track he has a record of three wins and is well suited by the long straight. This will be his first attempt over the two miles but he is a horse that I have always felt would appreciate the extended distance. He is a horse that takes a lot of riding to get him motivated and get into the race and he has blinkers added to his head gear, which should help him to focus. He is clearly one of the best performed horses in this race and I feel the blinkers, combined with the step up in distance, will make him the horse to beat. Race 3 is the Listed MRC Members Twilight Glow Stakes for three year old fillies over 1400 metres, my ride here is ZIZZIS who is trained by Patrick Payne. This daughter of Sizzling is raced by Joe O’Neill and partners and runs in the Prime Thoroughbred colours. I’ve ridden her at her past two runs and was successful on her at Caulfield over the same distance two starts ago when she went forward and made all the running. At her most recent run at Flemington she drew a wide barrier and was ridden off the speed, she had no favours on that day and put in a credible effort to finish less than five lengths from the winner. Unfortunately, she has drawn a wide barrier again here but there looks to be a good amount of pressure and speed on paper which should help her to find a position. She has a versatile racing pattern but will need luck in running. It will be interesting to see how the track plays and what my instructions are pre-race from the tricky draw. Race 4 is the Group 3 MyPunter.com Eclipse Stakes over 1800 metres, my ride here is TALLY who is trained by James Cummings. This six year old gelding by Street Cry is raced by Godolphin. I’ve ridden him with success throughout his three year old year and won two Group 2 races on him. He is dropping back in distance from the 2500 metres of his most recent run and has winning form over the distance. He is the class horse of the field who is suited over the distance and I’m looking forward to riding him again. Race 5 is the Group 3 Kevin Heffernan Stakes over 1400 metres, my ride here is FUHRYK who is trained by the Hayes, Hayes and Dabernig team. This five year old mare by Star Witness is raced by Michael Christian and partners. She can be forgiven for her last start effort at Flemington where the testing conditions on Melbourne Cup Day were not to her liking. I feel that with the exception of her last start, she has been racing well and if she finds her best form from last year, where she ran second in the Group 1 Winterbottom in Perth, she is one of the main chances. Race 6 is the Group 3 Araza Sandown Stakes over 1500 metres, my ride here is MAN OF HIS WORD who is trained by Dean Krongold. He was transferred to Melbourne at the start of this preparation and I have ridden him at both of his Victorian starts. He put in a terrific effort first up at Caulfield where he had no luck in running, closing the race off well and was only 1.35 lengths from the winner. His next run was at Flemington where he had the blinkers on and we ended up in the wrong part of the track, I felt he didn’t race to his best with the blinkers on and would be better suited around a turn. I like the placement of him here with the blinkers removed and feel he is racing in great form. This is a very competitive race and I feel he will make his presence felt. Race 7 is the Group 2 Ladbrokes Sandown Guineas for three year old’s over 1600 metres, my ride here is IGNITER who is trained by Robbie Griffiths. This colt by Snitzel is raced by Australian Thoroughbred Bloodstock and partners. I rode him first up this preparation at Bairnsdale where he was badly interfered with and had no luck in running. He then won his maiden at Stawell over 1300 metres before stepping up to Listed grade at Flemington over 1400 for his next start where he finished less than three lengths from the winner. He has drawn a favourable barrier and should gain an economical run in transit. The step up in distance should suit him and he will be given every opportunity to run his best race with the draw and distance in his favour. Race 9 is the Listed Clanbrooke Racing Doveton Stakes over 1000 metres, my ride here is THERMAL CURRENT who is trained by Darren Weir. This eight year old gelding by Exceed And Excel is raced by Contract Racing. He’s been racing in great form this campaign and I was successful on him last time out at Flemington in a similar race. Although he has been racing consistently this preparation, it was well over a year since his last win. He will carry 3 kilos more here than his last start but comes into this full of confidence. There looks to be a good amount of pressure in this race which will suit him as he finishes his races off strongly. If the track is racing evenly allowing horses to run on from back in the field, it would be great to make it back to back wins on him after his long run of outs. Today I’m racing in Singapore where the feature race on the card is the Singapore Gold Cup. The forecast is for stormy weather so it will be interesting to see how much rain falls and how it affects the track. Race 3 is the OCEAN PARK STAKES RESTRICTED MAIDEN (2 AND 3 YEAR OLD) over 1200 metres, my ride here is HUGO who is trained by Stephen Gray. He’s a three year old gelding by Smart Missile who has had two lifetime starts, finishing second on both occasions. He has drawn an inside barrier which is ideal as he races close to the speed. This looks a nice race for him to be winning his maiden. Race 7 is the HAPPY VALLEY STAKES KRANJI STAKES C over 2000 metres, my ride here is MOLINEUX who is trained by Stephen Gray. He’s a four year old gelding by Savabeel that is owned by St George Stable. He won his last start over 1600 metres when he was ridden by Beau Mertens on October 7thand has the benefit of a recent barrier trial to keep his fitness levels up to the mark. This will be his first attempt at the distance and he has drawn an outside barrier. If the track is racing evenly and the race is run to suit horses that are finishing off, he will be a horse that is going to be strong late. Race 10 is the DESTER SINGAPORE GOLD CUP over 2000 metres, my ride here is SKY ROCKET who is trained by Stephen Gray. This five year old gelding by Darci Brahma is owned by the Sky Rocket Stable and runs here with the light weight of 50 kilos. His chances will be further enhanced if rain falls throughout the meeting as he appreciates yielding ground. He will jump from an inside barrier and is a horse that needs to relax throughout the early stages and conserve his energy to allow him to be strong late. This race has previously been run over 2200 metres and drops back to the 2000 this year, which will suit my horse. If there is genuine speed throughout the early stages and he relaxes well for me, I expect him to be finishing off strongly and will be one of the main chances. Race 11 is the TSIM SHA TSUI STAKES CLASS 3 over 1200 metres, my ride here is CALCULATION who is trained by Lee Freedman. He’s a progressive three year old gelding by Street Boss who has had two starts in Singapore, winning both. Although he steps up in grade, he drops in weight here and has drawn a favourable barrier for a horse that races close to the speed. I’m hoping he has a good run in transit and can make it three from three. Today I’m racing at Flemington where it’s Stakes Day and it is also the final day of the Flemington carnival. The rail is out 8 metres and track is rated in the good range. I’m looking forward to walking the track to assess how it may play throughout the day given the amount of racing it’s had over the week. Race 1 is the Melbourne’s Own 3AW Trophy over 1600 metres, my ride here is BALCAZAR who is trained by Lee & Shannon Hope. He’s a five year old gelding by Sebring who I have ridden to success in the past. He comes into this third up this preparation, is stepping up in distance and will carry the minimum weight of 54 kilos. He is a horse that settles in the second half of the field and there looks to be a good amount of pressure on paper, which will suit him. If he returns to his good form from last preparation he can finish over the top of them. Race 2 is the Juvenile Diabetes Research Foundation Plate over 2000 metres, my ride here is TOP PROSPECT (NZ) who is trained by Darren Weir. This five year old gelding by Swiss Ace runs in the colours of Australian Bloodstock. He started his racing career off in New Zealand and is having his second preparation in Australia. Although he hasn’t won a race in Victoria he has been racing very consistently. His first up run in the Horsham Cup over 1800 metres was pleasing and he closed the race off well to finish second. He steps up to the 2000 metres here and from his two attempts at the distance has finished second and third. He has drawn a nice barrier and should gain an economical run from the draw. He looks to be one of the main chances in this competitive race. Race 3 is the Listed Watch Racing.com Springtime Stakes over 1400 metres for three year olds, my ride here is WAGNER who is trained by James Cummings. This colt by Bernardini is raced by Godolphin. I rode him two starts ago in the Guineas Prelude over 1400 at Caulfield where he struggled to get around the circuit. He dropped back in distance to 1200 metres at his most recent run at Moonee Valley, staying on well and finishing 2.3 lengths from the winner in fifth placing, in what was a fast run race. He steps up to the 1400 again here and will have winkers added to his head gear for the first time. He has drawn a wide barrier in a race where there looks to be genuine speed and if my instructions are to be conservative and allow him to finish off, he should be closing off strongly. Race 5 is the Group 3 Queen Elizabeth Stakes over 2600 metres, my ride here is ORMITO (GER) who is trained by Darren Weir. He’s an imported six year old gelding by Mamool (IRE) that is race by Australian Bloodstock and partners. I’ve ridden him on five occasions and although I haven’t won on him, I have always finished in the top four. He comes into this fourth up and is reaching his preferred distance range. His last start effort was in the Bendigo Cup where he finished in ninth position but was beaten by less than five lengths. This is a strong field but on his best form he will make his presence felt. Race 7 is one of the feature races on the card, it’s the W.F.A Group 1 VRC Sprint Classic over 1200 metres, my ride here is BRAVE SMASH (JPN) who is trained by Darren Weir. This six year old entire is by Tosen Phantom (JPN) and also runs in the colours of Australian Bloodstock. 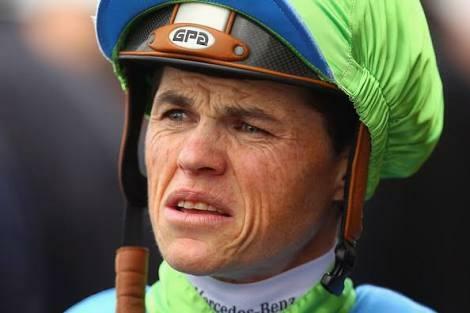 I rode him to success in the Group 1 Futurity Stakes over 1400 metres at Caulfield in February before being narrowly beaten at the course and distance at his next start in the Group 1 Newmarket, when finishing second. His last start run was at Moonee Valley where he produced a tough effort with the blinkers on to win the Group 1 Manikato Stakes over 1200. The race this year has produced a classic field of the best sprinters from around the world and I’m really looking forward to seeing how Brave Smash measures up. He has drawn a high barrier in a race where there should be a lot of pressure and if I can get him to conserve his energy throughout the early stages, I expect him to be fighting out the finish. Race 8 is the last Group 1 race we have in Victoria for the year, it’s the Group 1 Seppelt Mackinnon Stakes over 2000 metres, my ride here is EXTRA BRUT who is trained by Darren Weir. This three year old colt by Domesday runs in the colours of Aquis Farm. 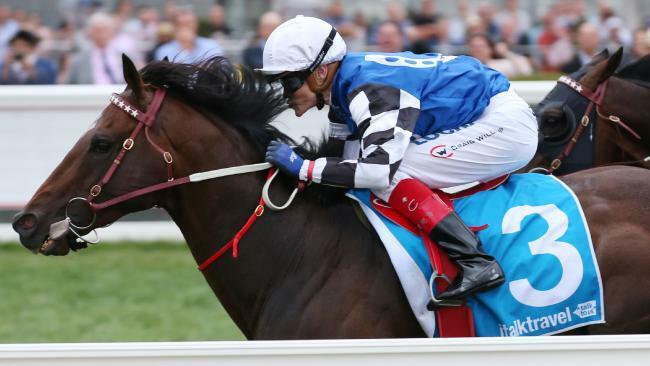 He won the Group 1 Victorian Derby over 2500 metres as his last start and drops back in distance here, where under the W.F.A conditions of the race he will carry the light weight of 51 kilos. He has drawn a wide barrier in the field of 10 runners so it will be interesting to see how the track is playing and what my instructions are from the draw. He has shown versatility through his career, racing effectively when ridden both on and off speed. He is a quality colt who from his six starts to date has only been out of the top two placings once. If he has freshened up well and he makes the most of his light weight, he will take a lot of beating. Race 9 is the last race of the 2018 Flemington Spring Carnival, it’s the BM80 Grand Handicap over 1100 metres, my ride here is ESPERANCE who is trained by James Cummings. This four year old gelding by Bernardini (USA) is raced by Godolphin. I’ve had one ride on him when he was a three year old having his second start at Sandown, he was a short priced favourite and produced an impressive performance to win by two lengths. He had been racing in Sydney for this preparation and was transferred to the Melbourne stables before his most recent run at Moonee Valley, where he finished off nicely into fourth place in a 955m race. He has drawn a high barrier which should place him nicely to the grandstand side of the track, assuming that’s the place to be. He carries 62 kilos here but is a quality horse who has the benefit of being exposed to the straight course previously and if he has a smooth run in transit and is able to build his momentum, he is one of the main chances. Today I’m racing at Flemington where it’s Oaks Day and the third day of the carnival. The rail is out 5 metres and track is rated in the soft range. There has been significant rainfall in Melbourne this week and I’ll be interested to walk the track when I arrive on course. Race 2 is the DrinkWise Plate over 1700 metres, my ride here is GLOBAL SANCTION who is trained by Grahame Begg. This is a capacity field with various form lines and it looks to be a strong edition this year. This four year old mare by Sebring runs in the colours of Pinecliff Racing. She’s been a consistent race mare throughout her career and has only missed a top three placing twice. She’s had three starts this preparation and comes into this as a last start winner. With a rating of 65 she looks well placed here where she will carry 57.5 kilos. She is stepping up slightly in distance which should be in her favour and she has winning form at the distance. She has the blinkers added to her head gear for the first time which should also be of benefit to her. She will appreciate the rain affected track conditions and is one of the main chances in this. Race 3 is the BM90 Twitter Trophy over 1800 metres, my ride here is LEGALE who is trained by the Hayes, Hayes and Dabernig team. This four year old gelding by Nicconi runs in the colours of the McAnulty family. He is a horse that will appreciate the soft track conditions today, with form on soft and heavy tracks. I have ridden him previously when he won his maiden in good style on a heavy surface at Ballarat. His last two runs have been very good, finishing second and fourth over 2000 metres. He comes back in distance to the 1800 here and has won over the distance. He has drawn a wide barrier and there doesn’t look to be too much speed on paper. He will carry 54 kilos and on his best form he will make his presence felt in this competitive race. Race 4 is the BM90 Off The Track Subzero Handicap over 1400 metres, my ride here is STRATOCASTER (NZ) who is trained by Emma-Lee & David Browne. This race is for grey horses only and it’s a wonderful contest to watch. Stratocaster is a seven year old gelding by Mastercraftsman (IRE) who has made the trip over from New Zealand. I saw this horse race in September and thought he would be an ideal horse for this race based on his rating and performances. He won his last start, which was the New Zealand version of the grey’s race over 1400 metres and his trainers were keen for him to make the trip to Melbourne to target this race. He has the benefit of a recent jumpout to keep his fitness levels up to the mark for this. I feel with his good, consistent form that he will take a lot of beating in this. Race 5 is the BM80 Melbourne Cup Carnival Country Final over 1600 metres, my ride here is COCHADA who is trained by Alexander Rae. He’s a lightly raced four year old gelding by Von Costa de Hero who I have a lot of time for and have ridden in all of his race starts. This race has been his target for the preparation and I’m looking forward to seeing how he measures up. I’m expecting he has taken natural improvement from his last start run and will have benefitted from the experience. I know he has the ability to win this, he just needs luck from an outside draw. Race 6 is the Listed Absolut Stakes over 1000 metres, my ride here is THERMAL CURRENT who is trained by Darren Weir. He’s an eight year old gelding by Exceed And Excel who is raced by Contract Racing and partners. I’ve had two rides on him, with one of those being at the course and distance where he was unlucky and was beaten by a subsequent Group 1 winner in March. His two runs this preparation have both been excellent where he was beaten by less than two lengths in each. He steps up to Listed grade here and looks well placed being 2 kilos above the minimum. I feel his outside draw will be of benefit to him as the track will have deteriorated by this race. This is a highly competitive field and if we have luck in running and he finds his best form, he can make his presence felt. Race 7 is the Listed TCL TV Stakes over 1800 metres, my ride here is PORT ROYAL who is trained by Alexander Rae. He’s a three year old colt by Captain Gerrard (IRE) who is still a maiden and is having his third race start here. The horse that finished second when he made his debut at Bairnsdale was the horse that finished second in the Derby, so he has strong form references coming into this Listed race. I’m expecting he has taken natural improvement from his two runs to date and it’s also interesting to note that the winner from his most recent run is contesting the Oaks today. He has drawn a wide barrier and he is a horse that generally settles in the second half of the field. This is a highly competitive race of good quality gallopers and I expect he will be given every opportunity to show his ability. Race 8 is the Group 1 Kennedy Oaks over 2500 metres for three year old fillies, my ride here is AMPHITRITE who is trained by Darren Weir. She’s by Sebring and runs in the colours of Flying Start Syndications. I’ve had four rides on her for four wins, including my last ride on her where she won the Group 1 Thousand Guineas at Caulfield over 1600 metres. She then contested the Group 1 Empire Rose Stakes against the older mares last Saturday. She ran extremely well but wasn’t able to gain clear galloping room in the straight. She is stepping up sharply in distance however she has the class to win this. She has great form on soft tracks and if she runs out the trip, she will be winning this. Race 9 is the Group 3 World Horse Racing Roses Stakes over 1100 metres for three year old fillies, my ride here is OUR LONG SALI who is trained by Patrick Payne. She’s by the good Tasmanian sire in Needs Further and is raced by Joe O’Neill and partners. She started her career in Tasmania where she was a dominant two year old. She contested the Group 3 Sires in Adelaide where she finished sixth and was beaten by less than two lengths. The horse that finished second in that race has subsequently been placed at Group 1 level multiple times. She was then transferred to Victoria and into the care of Patrick Payne. Her first up effort at Moonee Valley was very good and she was beaten by an official margin of 1.05 lengths. She has winning form on rain affected tracks and will be her first time racing over the straight course. She has drawn a low barrier and I will have a good idea on how the track has been racing throughout the day by this race. On her exposed form, I feel she can make her presence felt. Today I’m racing at Flemington where it’s Melbourne Cup Day. It’s the race that stops the nation and now that it’s been internationalised with a huge contingent of overseas runners in the race, it’s also the race that stops the world. It’s a long but exciting day of racing and one that my team has worked really hard towards. I’ve got a nice book of rides with some good chances and I just need a small amount of luck to get some great results. The rail is out 2 metres and track is rated in the good range with showers forecast. Race 1 is the Group 3 Bumble Stakes over 1000 metres for two year old fillies, my ride here is CHAMPAGNE BOOM who is trained by the Hayes, Hayes and Dabernig team. She’s by Spirit of Boom and was very impressive when she won on debut at Caulfield in a Listed race. Although she hasn’t raced over the straight course at Flemington previously, she has the benefit of a recent jumpout at the track. With race experience and the benefit of being exposed to the straight course on her side and confidence from her last start win, she is the horse to beat. Race 2 is the TAB APP Trophy over 1700 metres for mares, my ride here is SHOKORA who is trained by the Hayes, Hayes and Dabernig team. This Nicconi four year old runs in the Devitt and Gordon colours. Her form measures up with the favourite in this race however the favourite has drawn an inside barrier and I will start from a wide gate. Shokora is stepping up in distance here which will suit her and will carry the minimum weight. If she has luck from the barriers and throughout the early stages of the race, she will be one of the main chances. Race 3 is the BM90 Grinders Coffee Roasters Trophy over 1400 metres, my ride here is ECLAIR CALLING (NZ) who is trained by Phillip Stokes. This five year old gelding by Tartan Bearer (IRE) is raced by Thomas Li. I know this horse fairly well having ridden him in two of his past three runs and also in trackwork since his arrival to Melbourne. He won two starts ago at Caulfield when they put a claiming apprentice on him and his effort to the line was very good. He stepped up in distance to 1700 metres last start and I finished second on him at Caulfield. He races here at a course and distance that he is very effective at. I rode him recently at trackwork and was thrilled with the improvement I felt and the way he worked. From a middle barrier, he will gain an economical run in transit and based on his recent work and consistent racing form, he is the horse to beat. Race 6 is the Listed Jim Beam Black Stakes over 1400 metres for three year old fillies, my ride here is ZIZZIS who is trained by Patrick Payne. This daughter of Sizzling is raced by Joe O’Neill and partners. I rode her last start at Caulfield and was successful when winning over 1400 metres. She jumped from a wide barrier on that day and made all the running without having too much pressure applied to her and was very tough in fighting out the finish. She has also drawn a wide barrier here and this profiles as a different race entirely. It will be interesting to see how the track plays throughout the day and what my instructions are from the draw. If the track deteriorates due to bad weather, it will further enhance my horses’ chances having been exposed to soft ground previously. She has an adaptable racing style and is effective on all track conditions and comes into this with confidence from her last start win. This is a highly competitive field and she drops half a kilo in weight from her most recent run. She is a classy filly and if she produces the same will to win here, she will be one of the main chances again. 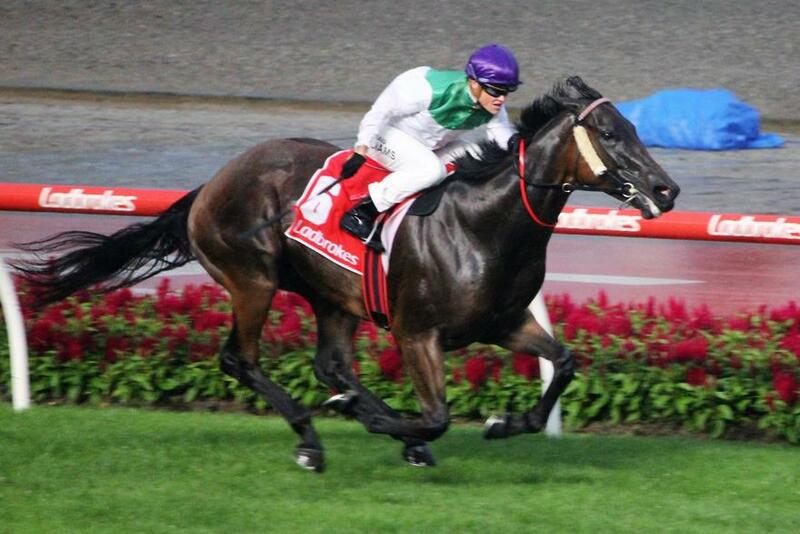 Race 7 is the Group 1 Lexus Melbourne Cup over 3200 metres, my ride here is YOUNGSTAR who is trained by Chris Waller. She’s a four year old mare by High Chaparral (IRE) and is the only mare in the field. In my opinion, she is the best credentialed Australasian runner to take on the international raiders. She has drawn a nice barrier in 8 and has the light weight of 51.5 kilos. She hasn’t been tested over the two miles previously however her breeding and recent racing performances indicate that she will relish the extra distance. She tends to settle in the middle to second half of the field and needs some luck in running. Her run two starts ago where she finished second to the mighty mare Winx, shows me she has the quality and performs well at the course. It is a very open race this year, but if we have luck in running she will make her presence felt. Race 9 is the Listed MSS Security Sprint over 1200 metres, my ride here is MAN OF HIS WORD who is trained by Dean Krongold. This six year old gelding by Lope de Vega (IRE) is raced by Grand Syndicates. I rode him in a barrier trial at Cranbourne for his new trainer before he resumed first up and I was pleased with his effort. His first up performance at Caulfield was extremely good where he had no luck and was beaten by an official margin of 1.35 lengths. I felt with clear running in the straight he would have won. He comes into this second up and has the blinkers applied to his head gear. This will be his first attempt over the straight course so I will have to be mindful of that. He has drawn a high barrier which should be beneficial, given the amount of racing the track will have had by this time of the day. He comes into this fitter for his first up run, carrying the minimum weight and with luck in running, provided he handles the straight, is the one they have to beat. Race 10 is the Group 3 The Hong Kong Jockey Club Stakes over 1400 metres for mares, my ride here is FUHRYK who is trained by the Hayes, Hayes and Dabernig team. This five year old by Star Witness is raced by Michael Christian and partners. I’ve ridden her with success in previous preparations and she is Group 1 placed. Her recent runs have been very good and indicate that she is racing back to her best form. She can be tricky in the barriers as she gets a bit claustrophobic which can cause her to jump slowly. If she can begin well here, from an inside draw she can race close to the speed but she has been slow out at her recent starts, therefore needing the races run to suit her. I was really impressed with her last start effort to the line and if she maintains that form, she is one of the main chances in an open race. Today I’m racing at Flemington where it’s Derby Day. I’m really looking forward to the day of racing ahead as it’s the start of the Flemington Carnival. The rail is in the true position and track is rated in the good range. Race 1 is The Group 3 Carbine Club Stakes over 1600 metres for three year olds, my ride here is QUACKERJACK who is trained by Mark Newnham. This colt by Not a Single Doubt has had eight starts and has won three of those. He is having his first start in Melbourne and comes into this with strong Sydney form, confidence from his last start victory and a win at the distance. He has drawn a wide barrier and if he can go forward and find a position on-speed without doing too much work, he will be in this for a long way. Race 2 is the Group 2 Mumm Wakeful Stakes over 2000 metres for three year old fillies, my ride here is SKYWAY STAR who is trained by Symon Wilde. She is a daughter of Americain who has had three starts and is still a maiden. Her two runs this preparation have been solid and she was narrowly defeated last time out at Ballarat over 1400 metres. It looks like the step up in distance here will suit her and I expect her to be competitive. Race 3 is the Group 2 The TAB Stakes over 1200 metres, my ride here is HAVASAY who is trained by Liam Birchley. He’s a six year old gelding by Rothesay who races second up for the preparation here today. He has excellent second up form and from his six attempts has a record of two wins and three placings. He ran very well first up at Caulfield and since then I have ridden him in an official trial at Cranbourne and I liked the feel he gave me. Osborne Bulls is the favourite in this race who, last start competed in The Everest run under WFA conditions, where he finished third, but if there is a horse that can beat him it is Havasay, who will carry the light weight of 53 kilos. Race 4 is the Group 3 Lexus Stakes over 2500 metres, my ride here is SIXTIES GROOVE (IRE) who is trained by Darren Weir. This race is the last chance for eligible horses to get into the Melbourne Cup should they win. Sixties Groove is a six year old gelding by Sixties Icon (GB) who is raced by Australian Bloodstock. He is a horse I know fairly well and I’ve had two rides on him for two wins including last start, where we won the Moe Cup over 2050 metres. He comes into this third up with a drop in weight, is stepping up in distance and I expect him to be one of the main chances. Race 5 is the Group 1 Coolmore Stud Stakes over 1200 metres for three year olds, my ride here is ENCRYPTION who is trained by James Cummings. This colt by Lonhro is raced by Godolphin. I’ve ridden him at his past three starts and two starts ago he was successful at the course and distance when winning the Group 2 Danehill Stakes. He then finished second to Written By in the Blue Sapphire at Caulfield. I felt Encryption would take further improvement after the Caulfield run as he was 4 weeks between runs. He has been set for this race and it gives me great confidence that he has winning form over the straight course. He has drawn a high barrier so it will be interesting to see how the track plays. He is horse that settles in the second half of the field and I will be hoping for a good amount of pressure to be put on the leaders. I’m very confident he goes into this as one of the main chances. Race 6 is the WFA Group 1 Empire Rose Stakes over 1600 metres for fillies and mares, my ride here is OOHOOD who is trained by Tony McEvoy. She’s a three year old filly by I Am Invincible who runs in the colours of Sheikh Mohammed Bin Khalifa Al Maktoum. She has excellent form from her 11 career starts, only missing a top three placing three times and has competed at the highest level in group company for most of her career. She is one of four fillies taking on the older mares today. The last two editions of this race have been won by fillies and my horse has strong enough form to continue the trend. Two starts ago she won her maiden in the Group 1 Flight Stakes before running a terrific race against the colts and gelding in the Group 1 Caulfield Guineas where she finished third. She has a tendency to be slow from the barriers, if I can get her to begin well and she gains an economical run in transit from an inside draw, she is one of the main chances. Race 8 is the Group 1 Kennedy Mile over 1600 metres, my ride here is BEST OF DAYS (GB) who is trained by James Cummings. This five year old entire by Azamour (IRE) is raced by Godolphin. Since his arrival to Australia he has only been out of the top three placings once and has been racing very consistently. 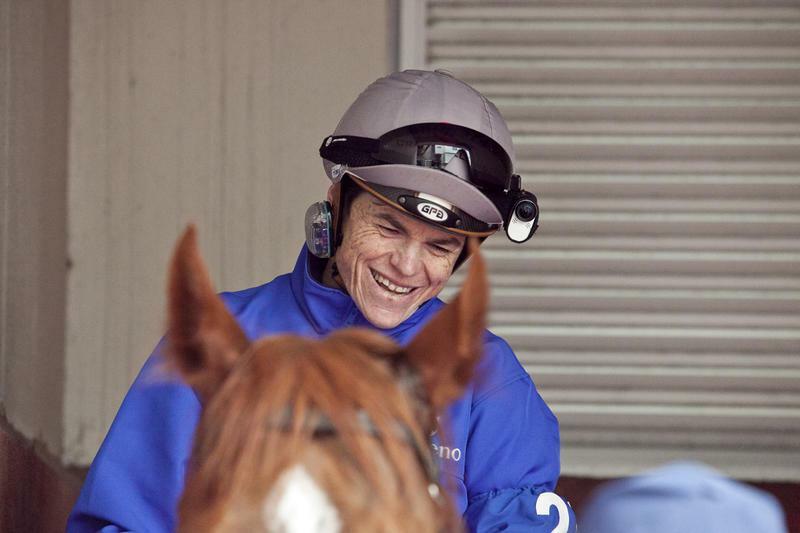 He comes into this at peak fitness and with confidence from his last start victory. He has drawn an inside barrier and will gain an economical run in transit. He has the blinkers added to his head gear for the first time and carries 52 kilos. I feel he is one of the main chances in what is a highly competitive edition of this race. Race 9 is the Group 3 Furphy Sprint over 1100 metres, my ride here is JORDA who is trained by James Cummings. This four year old mare by Exceed And Excel also runs in the colours of Godolphin. She has a good record at Flemington with winning form at the course and distance last year. Her recent form has not been as strong as last year but she did encounter a heavy track three starts ago, which she did not appreciate. This will be my first ride on her and I will have a good guide on how the track has been racing throughout the day to give her every possible chance to reproduce her good form from last Spring. Today I’m racing at Sale where it’s their Cup day. The rail is in the true position and track is rated in the good range. Race 2 is the Ladbrokes Back Yourself 3YO Maiden Plate over 1400 metres, my ride here is FIRSTCLASS DREAMER who is trained by Matthew Brown. He’s a three year old gelding by Dream Ahead who has had eight starts, placing at three of those. He placed second here two starts ago over the same distance and I rode him on that occasion. I was impressed with his performance on that day and he gave me the feel of a horse with above average ability however, as a colt, he had his mind on other things. He has since been gelded which will be a huge advantage to him and he is the horse to beat. Race 5 is the WorkforceXS The Melbourne Cup Carnival Country Series Heat 7 over 1400 metres, my ride here is COCHADA who is trained by Alexander Rae. He’s a lightly raced four year old gelding by Von Costa de Hero who has had three starts and hasn’t missed the top three placings. I’ve ridden him in all of his career starts and he is a horse I have a lot of time for. His effort at the end of his last preparation where he won at the course and distance was impressive. I rode him in a recent official trial in preparation for his return to racing and loved the improvement that he displayed. His trainer has been very patient with him and I can see the advantage of that in his development. If he races the way he trialled, he will take a lot of beating in this and will qualify for the final of this series over the Flemington Carnival. Race 7 is the Listed Ladbrokes Sale Cup over 1600 metres, my ride here is FASTNET TEMPEST (IRE) who is trained by the Hayes, Hayes and Dabernig team. This six year old gelding by Fastnet Rock is raced by OTI Racing and partners. I’ve had two rides on him for a win and a second placing. I rode him at his most recent start where he finished second at Caulfield in a Listed race over 1400 metres. The horse that won that race, Iconoclasm, has subsequently won again at Mooney Valley on Friday night, franking the form. He has a wide barrier to contend with and will carry 59 kilos, however he is the best horse in the race and if he maintains his good form and the track is racing evenly, allowing horses to close off, he will be winning. It would be great to see him win this after finishing second last year. Today I’m racing at Moonee Valley where it’s Cox Plate day. The rail is in the true position and track is rated in the good range. I’m looking forward to arriving on course and walking the track as the rail was in the same position for last night’s meeting. Race 2 is the Strathmore Community Bendigo Bank Handicap over 955 metres, my ride here is INVINCIBLE AL who is trained by Patrick Payne. This five year old gelding by I Am Invincible is raced by Joe O’Neill and partners. He’s had a freshen up coming into this and this is a pattern that has seen him perform well in the past. From his 13 starts at the distance his record is five wins and three placings. If the track is racing evenly and there is no bias with the rail in the true position, then he should be given every opportunity even though he has drawn a wide barrier. He is a horse that usually races off speed however four starts ago in Adelaide he was able to sit wide and on speed to produce a dominant winning performance. He looks well placed here as he carries two kilos above the minimum and is four kilos off the top weight. With luck in running on his best form, he is one of the main chances. Race 5 is the Group 3 1300 Australia Stakes over 1200 metres, my ride here is MORE THAN EXCEED (NZ) who is trained by Phillip Stokes. This three year old colt by More Than Ready is raced by Raffles Thoroughbred Racing. I rode him last start at Flemington where, with the blinkers on, he was keen and went forward from a wide barrier. He produced a solid effort and was beaten by less than a length in what is a strong form race with the second horse winning a stakes race at its next start. I galloped More Than Exceed at Moonee Valley on Tuesday morning in preparation for this race and he was fresh in his attitude and worked very well. He has drawn a nice barrier and if his second up run can be forgiven, he is one of the main chances. Race 6 is the Group 2 Aquis Farm Fillies Classic over 1600 metres, my ride here is MUSIC BAY who is trained by Phillip Stokes. This three year old filly by Choisir started her preparation off in great fashion when she finished second to Smart Melody at Flemington over 1100 metres. I rode her in her next run at Caulfield where she stepped up in distance to 1400 metres and was disappointing and wanted to hang out in running. Her most recent run was in the Group 1 Thousand Guineas over 1600 metres, she raced keenly and was beaten by less than five lengths. She drops back in grade here and if she can perform up to her trackwork on Tuesday morning, she will take a lot of beating in this and I feel she has the ability to win a black type race. Race 8 is the Group 2 McCafe Moonee Valley Gold Cup over 2500 metres, my ride here is RED CARDINAL (IRE) who is trained by Darren Weir. This race is an interesting one as it provides another option for horses that are targeting the Melbourne Cup. Red Cardinal is a seven year old gelding by Montjeu who is raced by Australian Bloodstock and partners. After running in last year’s Melbourne Cup he has been racing over unsuitable distances and has been building towards this. At his most recent start in Sydney over a similar distance he finished in third placing when racing on a rain affected track. He looked like he would take further benefit from that run and I thought his effort was quite good. If he finds his best form he can be very competitive here. Race 10 is the Group 2 Drummond Golf Vase over 2040 metres, my ride here is APPROACH DISCREET who is trained by Darren Weir. This three year old colt by Dawn Approach is raced by Winnie Law. He’s lightly raced and from his six starts has a record of two wins and two placings. It’s interesting to note that although he was a beaten favourite last start in Adelaide, he finished fifth being beaten by an official margin of 0.4 length. He has drawn a wide barrier here however has been ridden effectively both on and off speed, so it will be interesting to see how the track is racing and what my instructions are pre-race. On his consistent and progressive form, he will make his presence felt and his performance here will dictate if he backs up in seven days’ time in the Group 1 AAMI Victorian Derby at Flemington. Today I’m racing at Caulfield where the main race of the day is the Stella Artois Caulfield Cup. The rail is out six metres and track is rated in the good range, with showers forecast throughout the morning. Race 1 is the QMS Media Plate over 1400 metres, my ride here is ZIZZIS who is trained by Patrick Payne. This filly by Sizzling is raced by Joe O’Neill and partners. She started her career off in good fashion winning her first two races as a two year old, with one of those being the Magic Millions Classic in Adelaide. Since resuming as a three year old she has contested a Listed race over 1100 metres and a Group 3 race over 1200 metres, both against fillies and has finished sixth in both. She steps up to the 1400 for the first time here and has drawn a wide barrier in a small field. It will be interesting to see what my instructions are pre-race as she has won when being ridden on, and off speed. On her best form, she will be one of the main chances. Race 3 is the Group 2 McCafe Caulfield Sprint over 1000 metres, my ride here is SUPER TOO who is trained by Marc Conners. This five year old mare by Hinchinbrook is one of the quickest horses racing in Australia. Although I’ve never ridden her, I have ridden against her in races and watched her video’s and she has an amazingly high cruising speed. She has been disappointing in her two runs this preparation but she comes into this on the minimum weight with the winkers on for the first time. If she shows her usual speed she will be in this for a long way. Race 5 is the Group 3 New Zealand Bloodstock Ethereal Stakes over 2000 metres for three year old fillies, my ride here is COLLECTABLE who is trained by Robbie Griffiths. She’s by Sebring and is race by Australian Thoroughbred Bloodstock and partners. Although she is still a maiden, she has had three starts and has finished second on each occasion. She raced against the older horses last time out over 1755 metres and was narrowly beaten. I rode her in her first two starts and feel she has taken a good amount of improvement each time she has raced. The step up in distance here will be in her favour but she has an outside barrier draw to contend with. She will need luck in running and if she can run well here it will help with her placement in the fillies staying races throughout the Spring Carnival. Race 8 is the Group 1 Stella Artois Caulfield Cup over 2400 metres, my ride here is KINGS WILL DREAM (IRE) who is trained by Darren Weir. This five year old gelding by Casamento (IRE) was imported to Australia and started his career off winning a BM64 at Warrnambool and was undefeated in his first preparation, which concluded with him winning the Listed Mornington Cup and provided him an exemption from the ballot, gaining entry into this race. He has been set for this race by his trainer and when he resumed this preparation the stable reported he had put on 50 kilos and developed physically. He has improved his racing mannerism this preparation and most importantly, has taken the step up to W.F.A level, racing against the best horses we have in Australia. He comes into this with 53 kilos and will start from a very good barrier. He is versatile horse in regards to track conditions and his racing pattern. I had my first ride on him in the Turnbull Stakes where we finished third behind the mighty Winx and I was delighted with the way he went. I am really looking forward to riding him in this year’s edition, as I believe he is going to be one of the stars of weight for age racing in Australia and he can give me my third Caulfield Cup. Race 9 is the Group 2 Schweppes Tristarc Stakes over 1400 metres for mares, my ride here is FUHRYK who is trained by the Hayes, Hayes and Dabernig team. This daughter of Star Witness steps up to the 1400 for the first time this preparation and has a change to her head gear, with the blinkers off and the winkers on for the first time. I believe the outside barrier here will be in her favour provided she doesn’t have to cover too much extra ground, as she is a mare that appreciates galloping room. If she can find her best form she will make her presence felt.